This might be my favorite Imagine card that I have made! For this week's design team project for Creative Critterz Imaginations, I made this card inspired by one on Michelle Wooderson's blog, Mish Mash. I loved her idea of packages on a cake platter! For my card, I used my Imagine to print the black cake stand from the Sweet Treats Cricut Cartridge, at 1.3". To do this, I selected at 1" square first, to which I did not add any color or pattern (this way it was only a place holder; it didn't print). This pushed my cake plate a bit to the right, so I didn't have to have it print in the corner of my cardstock. I also flipped the cake plate vertically, so that it would be orientated with the bottom of the cake plate at the bottom of my cardstock, and then printed it using the "Print Only" feature. To get a better understanding of this method, you can watch a video by Linda Kaiser of The Paper Boutique. 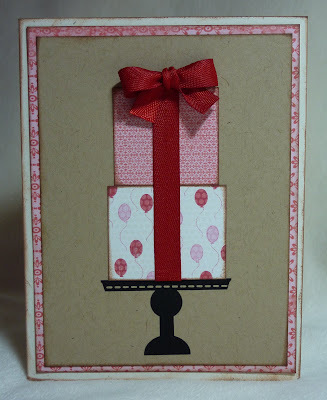 For my packages, I cut a 2" square filled with the balloon pattern from the Yummy Imagine cartridge and another 2" square with a pattern from the Imagine More Cards cartridge. I then trimmed them down to sizes that looked good on the cake plate. After inking around the edges, I adhered red ribbon to the front of them, and adhered them down to the Kraft cardstock, on the cake plate. Finally I added a little red bow. The patterned background layer is the same pattern from Imagine More Cards. The scale is just larger since it is on a larger rectangle. 8 1/2" x 5 1/2" Papertrey Ink Rustic Cream Cardstock, scored at 4 1/4"
oh my goodness, this is so perfect! the cake plate looks like a rub on! you are making it really hard to still not want an imagine! So simple, yet so cute! I love it!